The starting gun fired some time ago on the race to create a global satellite internet network. Last week OneWeb, backed by the Virgin Group and Qualcomm, stretched its legs with the announcement of a $500 million investment from companies including Airbus and Coke-Cola. The project intends to create a network of 648 microsatellites providing global high-speed internet and telephony services, to ensure everywhere on the planet has access. It’s planned these will be launched in batches, starting in 2017 with go live in 2019. However, OneWeb isn’t the only runner in this race. Elon Musk’s Space X company, backed by Google, also has plans for a 4 000 strong internet satellite network; testing is due to begin in 2016 and current plans have it reaching full capacity around 2030. These two developments could signal a change of pace in the satellite industry, as they will both be using mass produced satellites. Although neither project has realised the specifications for their microsatellites, some details are available. Both networks will be in Low Earth Orbits of around 1100 to 1200 km, weights will also be similar with OneWeb’s at 150 kg and Space X’s slightly more at around 200 kg. The microsatellite size is expected to be around half a square metre – although little has been announced about this to date; Airbus was recently awarded the build contract for OneWeb. Both constellations plan to use the microwave frequency Ku band, although Space X has also indicated interest in the Ka band. Apart from mass production, the other element of these networks worth thinking about is the sheer quantity of satellites involved. The United Nations Office of Outer Space Affairs recorded 239 satellites launched last year, and this was the greatest number ever launched in a single year. According to the Union of Concerned Scientists last satellite database, from 31 January 2015, there are current 1 265 satellites in orbit around the Earth. Therefore, if both of these projects cross the finish line, they will more than quadruple the current number of satellites. More objects in space increases the likelihood of potential collisions and impacts, and increases the potential space junk and debris in the atmosphere – although, OneWeb has already announced plans for deorbiting its satellites at end of life. This increase of objects in LEO does bring to mind the Kessler Syndrome hypothesized by Donald Kessler in 1978. He proposed a scenario where the density of objects in LEO is so great that the debris from a single collision between two objects would set off a cascade of subsequent collisions so great, that it would prevent any further spacecraft from passing through the LEO area; as explored in the 2013 film Gravity. This level of satellite concentration will need careful managing and monitoring. 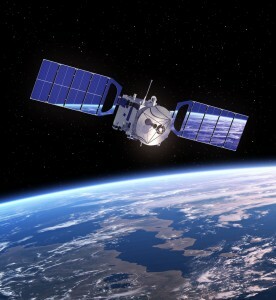 In terms of Earth observation, the satellites will probably cause minimal impact. Due to their size, they will show up as rogue pixels on very high-resolution images, but wouldn’t register on the coarser resolution of systems such as Landsat. In terms of frequency bands, the Ku band isn’t generally used for Earth observation; although the altimeter, ALTIKA, onboard the joint French and Indian SARAL mission does operate at the Ka band and any use of that band by the Space X project will be worth watching. This isn’t the first time Earth observation has had to fight its corner for bandwidth, there is an ongoing battle with mobile data companies for use of these microwave frequencies that could also be used for wireless data transmission. The internet satellite space race is an event that must be watched, it will change the satellite and telecommunication industries; and has the potential to change fundamentally what orbits the Earth. This entry was posted in Earth Observation, Policy, Satellite communications, Satellite Telecommunications, Space Industry, UK Space Industry, Understanding Space and tagged Airbus, ALTIKA, film Gravity, Internet satellite space race, Ka, Kessler Syndrome, Ku, LEO, Low Earth orbits, microsatellites, microwave frequency, OneWeb, Space X, Union of Concerned Scientists, United Natons Office of Outer Space Affairs by Andy. Bookmark the permalink.